Wide skis are nothing new—they’ve been around for a long time. But today’s powder skis are different weapons, blending width, sidecut, and rocker in ways that make them amazingly good at what they do. They’ve changed the way we ski, too. For one thing, as we’ve spent more time nearer the surface of the snow, we’ve evolved from a world of short-turning powder conservationists who would ski next to each other, spooning tracks and making the pow last all day, to powder pigs who lay waste to huge swaths of powder in a single run, then complain about how fast resorts get tracked out. More important, the way we ski powder has come to resemble the way we ski groomers. What used to be two different techniques have morphed into one that has slight adaptations. Only the best and most experienced skiers could master the technique necessary to ski powder in the skinny-ski era: legs held tightly together, lots of vertical movement, lots of flexion and extension, skis kept underneath the body, a fair amount of upper-body rotation, and weight distributed evenly between skis. It was tricky, and powder was discriminatory about who could have success. The slightest lapse in concentration or technique could result in a sudden diverging of the ski tips and a cartwheeling yard sale. Today, what works on groomers also applies in powder: a wider stance, skis out from underneath the body, higher edge angles, less jumping up and down, and aggressive pressuring of the outside ski. » A wider stance: Notice how Brown keeps her legs farther apart than skiers of the recent past. Her skis are wide and buoyant enough that it’s no longer necessary to clamp them together to make a bigger platform. » Commitment to the outside ski: No longer do you have to keep your weight distributed 50/50 between skis. Trust your outside ski and stand against it, as Brown does here. » Higher edge angles: Get your skis out from underneath your body, where they can bend and work for you. When your skis stay under you, bending them only causes the tips to point up. When your skis are out from under you, as Brown’s are here, they bend and arc in the direction you want to turn. » Patience: In deeper snow, you have to be extra patient. It takes some time for the snow to compress enough to bend your ski and start the turn. Stay balanced against your outside ski and give your equipment and the snow a chance to work together. 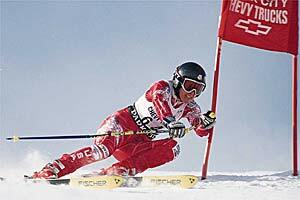 Slalom ace Claire Abbe Brown is a former NCAA All-American for Denver University and a multiple Nor-Am winner. She now travels the World Cup circuit as publisher of Skiracing.com but looks quite comfortable in powder near her Utah home. Power skiing is easy—unless it’s just a thin cover on bumps. Here's how to deal.